"It's official! Rapunzel is going to officially be welcomed as the 10th Disney Princess character at a high-profile, star-studded celebration on October 2, 2011! And it's happening at Kensington Palace, London, UK - the perfect location for this magical welcoming ceremony of a Disney Princess, as it has been the home of many real life princesses over the centuries. Little princesses from across the globe will watch Rapunzel be welcomed into the Disney Princess royal court by Ariel, Aurora, Belle, Cinderella, Jasmine, Mulan, Pocahontas, Snow White and Tiana. And Disney is hosting a fabulous Sweepstakes for a chance to win a trip to the event! Enter the contest here. -A star-studded global celebration takes place October 2, 2011 at Kensington Palace, London, UK. -Across all Disney Parks, Rapunzel will for the first time wear her royal tiara, stolen from the kingdom by Flynn Rider in the Tangled film. -All ten Disney Princess characters will take part in the royal celebration and will be joined by VIPs, celebrities and little princesses from across the globe in festivities including a procession through Hyde Park, party activities and a welcoming ceremony. 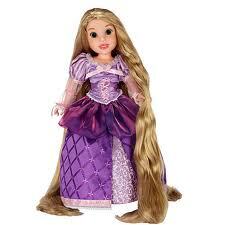 Rapunzel may have lived her whole life locked inside a hidden tower, but she is no damsel in distress. She is an energetic, inquisitive teenager who fills her days with art, books and imagination. Rapunzel is filled with curiosity about the outside world and can't help but feel her true destiny lies beyond the lonely tower walls." Buy It: You can find the Princess and Me or the My First Disney Princess Rapunzel dolls at Toys R Us and Amazon! 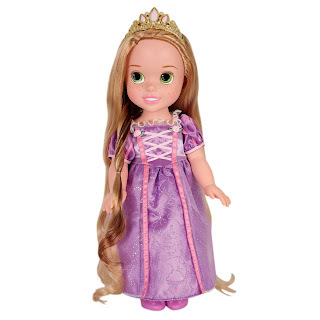 Win It: One ABCD Diaries reader will win a Disney Princess and Me Rapunzel Doll!! To enter, follow our blog via GFC and comment below. Giveaway ends Wednesday, August 31, 2011 at 11:59cst. Winner will be chosen via random.org and emailed. They will have 48 hours to reply. Open to US residents 18+:) No PO Boxes. Disclosure: ABCD Diaries was given in no other compensated for this post. The opinions expressed in this post are ours and ours alone. I entered the veggieTales Princess and the Popstar giveaway. I am following you via gfc and thank you for the great giveaway. follow on GFC. Would love to win for my great-niece. Thanks for the chance. entered tropical traditions coconut peanut butter giveaway. entered your hallmark back to school giveaway. I'm a gfc follwer: theresan, please sign me up. This would make some little girl I know very happy. GFC follower (coliebear) and this would be a great birthday present for my toddler son's little friend. I liked ABCD Diaries on Facebook to enter! My daughter is 4 and would love this! im a gfc, idk why it wont let me log in, but i want the bigger one! I like ABCD diaries on facebook!!!!!! I follow you on GFC(Linda G) and this doll would be perfect for my niece. I entered that sweepstakes to go to london. That would be awesome!